Two months leave for polls work? Today we publish more findings obtained during the first wave of opinion polls conducted in view of the October 10 General Elections. This series of opinion polls conducted by one of Sri Lanka's leading market and economic research firms, ORG-MARG SMART attempts to understand people's perceptions and attitudes towards macro issues. The readers should keep in mind the margins of error and the possible favourable bias towards the ruling party when coming to conclusions based on these results. The poll was conducted among an island-wide sample of 1299 respondents, covering the 17 districts outside the North and East, to represent the entire voting population of the country in these areas. The fieldwork was conducted from August 30 to September 7. The following results would help gauge the satisfaction levels with the performance of the PA government during the past six years, on the two main issues concerning Sri Lankans today, the economy and the N-E conflict. The graph also shows a comparison of the same ratings prior to the Presidential Elections in Dec. 1999. The results indicate that Sri Lankans are not happy with the way the PA government has handled the economy while they are satisfied with the general governance of the country and the handling of the N-E conflict. However, the government's performance rating has significantly dropped from prior to the Presidential Elections in December 1999 on all three issues. To gauge the reasons behind people's decision to vote for a particular party, the respondents were asked 'why do you vote for this party?' Last week we published these results for the UNP and the PA only, however, since the interpretations of those results in some of the publications were not very clear, we are once again presenting them along with the results for the JVP. The graph gives the main reasons, which motivate the respondent to vote for the UNP, the PA or the JVP. The analysis was done taking each party's vote as 100% and further analyses were carried out to see why people are voting for these parties. The results indicate that 47% of the UNPers vote for the UNP because they always do so, while only 32% gave the same response for PA. This indicates that party loyalty is higher among the UNPers than among the PA supporters. It can also be concluded that the PA votes are driven by leadership qualities while both the UNP and JVP votes are driven by the capabilities of handling the country's problems. It was interesting to note that the 6% of the JVP voters are voting for the JVP because they want a change. We have further analysed the data to see how appealing each party is among different segments of the Sri Lankan voter population. Note that these results should be read as taking each party's vote as 100%. Who is the UNP/PA/JVP voter? It is interesting to note that there is a male bias to the UNP and the JVP because only 41% of those voting for the UNP are females, while only 51% of those voting for the PA are females and this goes down to 20% for the JVP. On ethnic group analysis, the UNP seems to have won the hearts of the minorities, with 12% of UNP voters coming from the minorities while 92% of those voting for the PA and 95% of those voting for the JVP are Sinhalese. Also interesting to note is that the JVP voters are the youth with 67% of the JVP voters coming from the age group 25-40 years whereas the majority of the PA/ UNPers are from the 25-55 age group. Await more results from a new poll next week! ORG-MARG SMART is an independent private market and economic research agency undertaking research mainly in the areas of consumer goods and services. It is the country's largest employer of full time market research staff and works for a multitude of clients both private and public as well as local and foreign. It is a Dutch, Indian and Sri Lankan joint venture. For further details of these opinion polls, visit the OMS web site at www.omsresearch.com. Survey Research Lanka (Pvt) Ltd. conducted an opinion poll for Wijeya Newspapers Ltd. and Upali Newspapeers Ltd. The SRL says the results of an opinion poll are not a prediction of the outcome of an event due to occur some time at a future date. However, it says the trends that emerge by conducting a series of poll at regular intervals could be used to predict the outcome of the event under study. The SRL survey was commissioned as a 'one shot' opinion poll. A sample of 2250 individuals, 19 years and over, was selected from 17 districts of the Island excluding the Northern and Eastern Provinces. A three stage random sampling technique was used for this purpose. The maximum error of sample estimates is thus plus/ minus 2%. Of the 2250 individuals selected for the survey, only 15 (i.e. 07%) refused to participate. This is indeed fortunate, because a high refusal rate would have cast doubts on the reliability of the results, the SRL says. To the question "how would you compare the performance of the previous UNP government and the present PA government in an overall sense", 36 percent thought that both governments were the same. The PA scored 33 percent to the UNP's 14 percent to the question which government was better. To the question which party is best suited to govern Sri Lanka during the next six years, the PA was ahead with 45.6 percent against the UNP's 40 percent with a significant 5.5 percent to the JVP and 7.7 to others. In view of the upcoming General Elections, Social Indicator, a private research organisation which is the polling unit of the Centre for Policy Alternatives, embarked on a survey of 18 districts, including some areas close to the conflict zone, to assess the current situation. The survey also aims at gauging the people's views on the future and other issues. The results are findings from the opinion poll of 1008 respondents. The survey results were made available to The Sunday Times. We carry below some of the survey results connected to the October 10 election. Of the 922 respondents willing to disclose whether or not they will vote at the forthcoming general elections, 95% say they will definitely vote, while 4% are as yet undecided, and only 1% state they will not be casting their vote. Expectations for a free and fair election do not seem to be high. Only 23% expect the forthcoming elections to be free and fair, lower than the 27% who thought the 1999 presidential elections were not free and fair and 25% think the 1999 presidential elections were not free and fair and 25% are not sure. Some 18% do not expect the coming elections to be free and fair and 59% are uncertain. 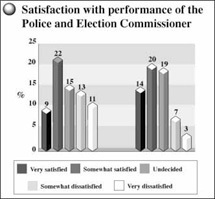 Meanwhile, 31% say they are either very satisfied or somewhat satisfied with the performance of the Police, as opposed to 24% who are not. The performance of the Election Commissioner is also looked upon relatively favourable, with 14% saying they are very satisfied with his performance, and 20% saying they are somewhat satisfied. The Sunday Times today carries results of a socio-economic and political survey conducted by Research International (Pvt) Ltd. 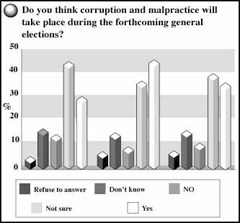 The poll conducted in 13 districts — Colombo, Gampaha, Kalutara, Kandy, Nuwara Eliya, Galle, Puttalam, Anuradhapura, Badulla, Moneragala, Ratnapura, Batticaloa and Ampara — with the participation of 2,500 respondents deals with a wider range of issues. The respondents were asked what was the most serious problem faced by them. Some 48.9 percent said it was the costof living while 35.1 percent said war. The UNP scored higher percentages than the PA in the areas of managing the economy, reducing the cost of living and effective governance. The PA's rating was better on the question of maintaining law and order, solving the ethnic crisis and reducing corruption. Asked whether they believed the government allegations through the state media that UNP leader Ranil Wickremesinghe had LTTE connections, 42 percent said they did not believe they were true while 36.9 percent said they believed he had LTTE links. The respondents were also asked whether they think PA supporters were responsible or not responsible for the killing of a JVP activist in Colombo and an UNP activist in Kegalle while they were engaged in pasting posters. Some 45.8 percent said PA supporters were responsible while 27.5 either refused to answer or had no answer. For the vital question of conducting a free and fair poll, an overwhelming majority — some 53. 7 percent — said the government would not conduct a free and fair poll. Those who believed the polls would be free and fair are 35.2 percent. "Do you agree or disagree with the decision taken by the PA to include Varatharajah Perumal into their National List," was another question. While 62.8 percent disagreed, 23.7 percent agreed. Some 78 percent of the people said the PA had not fulfilled promises made in the 1994 manifesto and 49 percent said the UNP leader would not find the funds to fulfill the promises made in its 2000 manifesto. The respondents were asked whether they thought the President's decision to increase the salaries of public servants and pensioners was taken to counter the commitments made in the UNP Election manifesto, some 46.5 percent said yes while 34 percent said no. 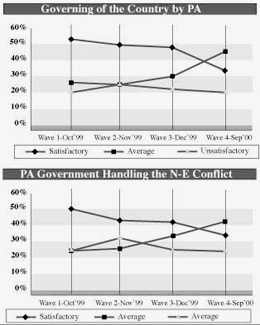 When asked how satisfied they are with the performance of the PA government, 8.7 percent said very satisfied, 19.9 percent said satisfied, 19.9 percent partially satisfied and 21.1 percent not satisfied. To the sensitive question who would they vote for at the upcoming elections, the response was equally weighted towards both the UNP and the PA, though the ruling party was slightly behind. 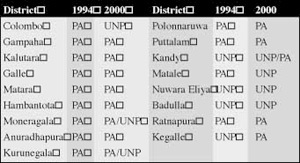 Those who said they would vote for the UNP were 38.1 percent while those who said their choice was the PA formed 37.9 percent. The JVP had the support of 7.9 percent while the Sihala Urumaya support was 3 percent. When asked what would happen at the next parliamentary election, 47.3 percent said PA would be re-elected while 42.4 percent said there would be a change of government. The results of an opinion poll are not a prediction of the outcome of an event due to occur some time at a future date. It is merely an indication of the direction in which 'the wind is blowing' at the time the poll is conducted. However the trends that emerge by conducting a series of polls at regular intervals could be used to predict the outcome of the event under study. The pollsters also speak of 3-5% margine and a tendency in country's like Sri Lanka for a slight bias towards the ruling party.